Easily influenced and having read the review by John Lanchester in the Grauniad on Saturday, I hastened my way to My Sichuan. Despite living not a half hour from the home of Morse, I rarely venture there for food. Why would I? It’s mediocrity central. Whilst there’s an enormous amount of choice, there isn’t an enormous amount of quality and as a massive ethnic food junkie , I find that most of the Oxford offerings are a pale imitation of the real thing. Bland and unadventurous, maybe they don’t really have to shine, having, as they do, a captive audience of not-too-discerning students, for whom the all-you-can-eat buffet is the most important ingredient. I’m not knocking it – I was that person too, a thousand years ago, but I’m a grown-up now, at least on paper and I want something more than simply big portions. – find the jolly Chinese woman who is clearly the owner. Get her to run through the menu with you. She will explain the difference between the hot and spicy prawns, the hot and spicy prawns and the hot and spicy prawns. Three pictures of hot and spicy prawns, like a spot-the-difference competition, three different prices. -And the food? We liked. We really liked. Other than the above, we stayed on the sensible side of Sichuan. For our first foray, we tried some old faithfuls; chicken in black bean sauce, prawns in chilli with cashew nuts (to compare with Hakkasan (see previous review)), crispy potatoes with chilli and “fish in sauce”. That sounds exciting doesn’t it? Fish in sauce. Now you see where the pictures come in. Unfortunately for you, my BB unilaterally decided to drain itself at the moment of delivery, otherwise I’d have posted a picture. Fish in sauce was a soup, enough for at least 3 people (and this is a “me” 3, which I believe translates to a supermarket “serves 6”) and came with floating bombs of chilli, hot enough to hospitalise you. It was delicious. The prawns came in an unctuous sticky/sweet/garlicky sauce. We cleared the plate. All of it – other than the potatoes – delicious, well cooked and properly and robustly flavoured, with little concession to western palates. – don’t order the crispy potatoes. Thin strips of slightly undercooked, anaemic potato, sliming around on a plate, garnished with chopped chillies. Pale and uninviting, the only crispiness was found in the raw potato. I was hoping for a Chinese version of Rosti. This isn’t it. But that was the only duff note and don’t let it put you off. – and it’s a mad wine list too. They had everything from your obigatory nasty cat’s-pee-on-a-gooseberry-bush Sauvignon to a Chateau Talbot 2005 at £189. Not that you would, with all the chilli. Worth a drive from London? Probably not. But if you’re in the area it’s certainly worth a detour. And because you will over-order you will be pleased to know that they let you take away the bits you couldn’t quite manage. If you ever go again, you absolutely MUST try the dish above, trust me! The chilies are actually removed by the waiter before eating, so the spice level is not that bad. 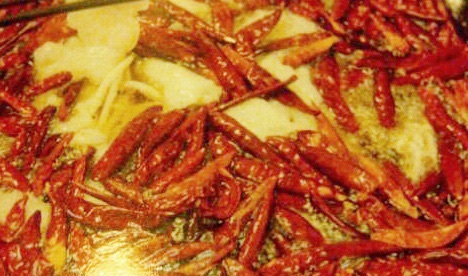 The sichuan peppers turn this fondue-like fish into a delicacy.